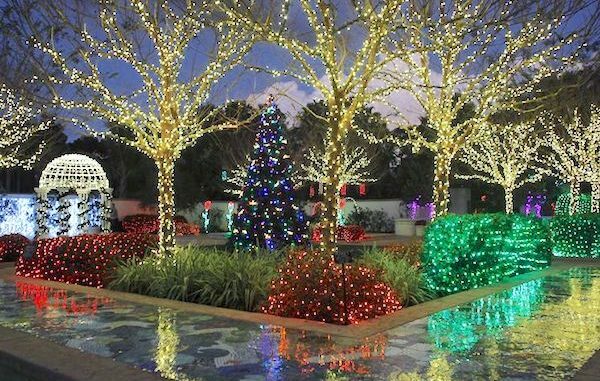 Celebrate the holidays at the McKee Botanical Garden in Vero Beach. VERO BEACH – McKee Botanical Garden will be hosting Holidays at McKee Botanical Garden December 21-23 from 6:00 p.m. to 8:00 p.m. in Vero Beach. They are welcoming everyone to get into the spirit of the holidays as McKee comes alive with thousands of twinkling lights, holiday decorations, a large-scale model train display, an organ band playing holiday music, and a visit with Santa and Mrs. Claus. Admission for this event is $12 Adults, $11 Seniors, $8 Children ages 3-12, members and children under three are free. Gates will close at their regular time of 5 pm, and they will reopen for this nightly event at 6 pm. The address for McKee Botanical Garden is 350 S US Highway 1, Vero Beach.